Make A Plan. Knowing what to do starts with assessing your home and family: Are your children smaller and will need extra help? Older and independent? What is likely to happen? Should you spend your time planning for a home fire or household chemical emergency? Or flooding or tornado? Don’t forget to consider your pets! 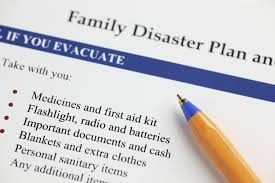 Consistency and familiarity help kids, get the whole family involved: Build an Emergency Kit. Have a Communications Plan. Talk about what might happen and what you are going to do to be safe. And practice! When kids know they can succeed at one thing, it is easier for them to try others. Have a plan for a home fire, including two ways out and a meeting place. Make sure everyone can use both ways out. Often the second exit is a window, and children don’t know how to remove a screen. Or the need for an emergency ladder is overlocked. Practice calling 911, and have mom or dad be the operator and ask questions such as name and address and what is happening. Practice your communications plan. Family communications plans should include an out-of-town contact. Allow your children to dial and talk to that person, often these people are family who will enjoy the call! Set up a specific time your child can call you at work, so they know in an emergency they can get through, or that a switchboard operator will answer the phone. If you have a remote meeting area, and your children and family members will need to walk or drive, go with them, but have them lead the way. You don’t want the surprise of finding out they don’t really know how to get someplace because you always lead the way. For kids that ride the bus, they only way they know to get to school might be the long way the bus goes, and not the short walk just down the street.